The composition of music is a complex, creative and collaborative act. This is currently done with a range of tools including the editing of musical notation, the playing, recording and playback of musical phrases, and their verbal discussion. Existing music composition software focuses on mixing entire compositions on a desktop or laptop computer. This shifts the locus of composition to a particular place or machine, and fails to capture the spontaneous, distributed and collaborative nature of composition and its relation to performance. The Com-Note project extended Com-Phone to bring these activities together in a single ‘composer’s notebook’ app. Its approach is mobile, flexible and collaborative by design, and more in the spirit of a sketchbook than a mixing desk. 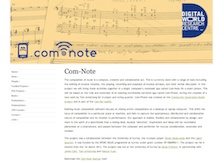 Com-Note was developed and trialled during the creation of a new composition. The application, source code (license: LGPLv3) and full documentation are freely available as part of the project.